The most common bunkers on gaming tables are concrete ones. While it is true that concrete is the most preferred material to construct a bunker with, it wasn’t the most common material used. The vast majority of bunkers are built by common soldiers out of whatever materials they can scrounge. Frequently the only assistance they receive is a supply of empty sand bags from the supply system. These makeshift arrangements can produce a very ragged looking pile of dirt and stuff, but they usually get the job done! 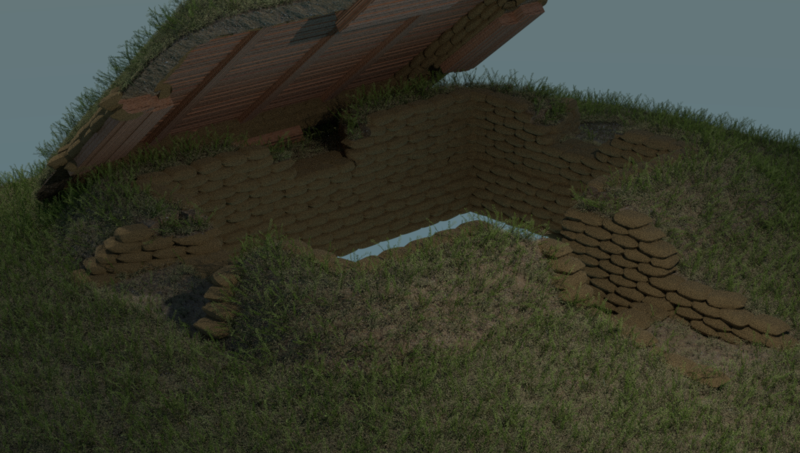 A sandbag bunker is unfortunately a very daunting task to sculpt, since even a small bunker would require a thousand sandbags or more. At 15mm scale a sandbag is very small, so doing a lot of them would take a lot of time. I also happen to have zero sculpting ability so, I had to find another way to do this project. Doing the sandbags digitally on the computer and printing them is (for me, at lease) the fastest and easiest way to make them. The first step when making a bunker is digging a large hole in the ground. Obviously making a small depression into your gaming table will give you the best results. Since we like to use terrain that sits on top of a table, we will instead be using a base. By using a large base with a gradually sloping glacis, we are able to make that hole look a little more like it’s in the ground, and not just sitting up high. The next step is to start reinforcing the edges of the hole with sandbags, and add a parapet with firing ports in it. Lots of dirt is then piled up against the sandbags, to make the bunker as bullet proof as time permits. The tops of the firing ports are then covered with whatever material can be scrounged, and some more sandbags. Once the height of the sandbags is sufficient to stand up in, it is time to add the roof supports. Usually this would simply be some local trees that had been cut down for this purpose, or even timbers ripped from local buildings. Even more dirt would then be piled on to provide some protection from indirect fire, and everything would be as camouflaged as possible. This piece of terrain is going to be made in two pieces so that the top can be removed if desired. Or, the two pieces can be glued together, and the model will be placed over a unit on the table. If the pieces are glued together, it would be possible to completely remove the seam for a very realistic look. The hole in the bottom is sized to fit a medium Flames of War base, so it’s perfect to be used as a machine gun bunker. Previous post: New Modular bridge parts have been added to the store!